United States citizens welcome. Formerly Bodog before re-branding. Compatible: Samsung, iOS, Sony Xperia, Motorola, Blackberry etc. 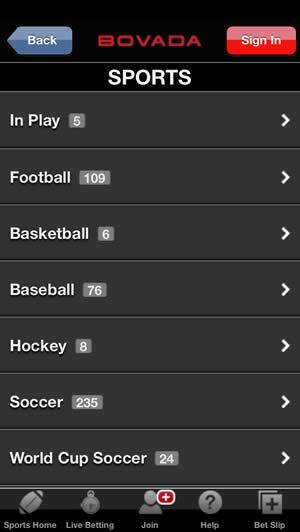 Lines on all major sports: NFL, NBA, NHL, NBA, golf & UFC/MMA. 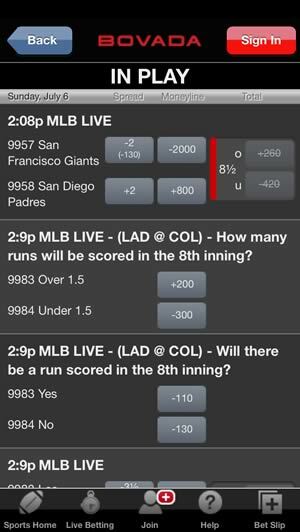 Place bets on in-play games by visiting the "Live Betting" section. Bovada offer faster payouts than any other US friendly sportsbook. Finding a quality, mobile-friendly sportsbook that still accepts US-based bettors used to be a major problem just a few years ago, but due to the dedication and talent of people running sites like Bovada this is no longer the case. The history of Bovada intertwines with the history of Bodog, which is one of the most respected companies operating in the online gaming industry. The US version of Bodog quickly became the market leader in North America. As you’d expect, Bovada was allowed to use Bodog software, giving American real money gaming enthusiasts access to all the latest world-class poker, casino and sports betting products. Bovada operates under a license issued by the Canadian Kahnawake Gaming Commission. As you’d expect from a modern sports betting site, the mobile version of Bovada is HTML-based and doesn’t require you to download and install any dedicated gambling apps. This means that the app is 100% compatible with a wide range of mobile devices, including Android systems, Blackberry smartphones, iPhones, iPads and Windows Phones. Joining the action on Bovada is as simple as opening bovada.lv using your favorite web browser and choosing Bovada Sports in the main lobby. Quite obviously, placing a bet requires you to have a Bovada account. Thankfully, the entire registration process doesn’t take too long and can be completed without switching to the desktop-optimized version of the site. Bovada is well known for its generous bonuses and promotions, so it should come as no surprise that new customers are free to take advantage of an amazing Free Bet bonus of up to $250. This bonus is a 50% match on your initial deposit and should become available within 30 minutes from making your first payment. The promotional funds may be used on any sport, wager type and odds, but keep in mind that the bonus has a 3x rollover requirement, which means that your total sports betting action must exceed 3x the amount deposited and credited to your account before you’ll be allowed to withdraw. Bovada provides you with a wide range of betting opportunities, particularly when it comes to popular American sports such as football, basketball, hockey and baseball. Despite the fact that the site caters predominantly to US-based customers and tends to focus on American leagues like the NBA, MLB, NHL or NCAA, featured lines often include high-profile international events, such as the World Cup or the Wimbledon. Bovada supports all the popular wager types, which means that the vast majority of traffic is generated by traditional money lines, totals and point spread bets. Even though Bovada hold a dominant position on the US online sports betting market, the prices tend to be fair and may even be better than the ones offered by many major international sportsbooks. Finally, it is worth pointing out that Bovada provides you with plenty of opportunities to take a break from wagering on traditional sports by placing proposition bets on professional poker, celebrity life, film and television, business and politics. The site even has a separate category for weird wagers, which should give you some idea how gimmicky and varied these additional props can actually get. Bovada has a separate, well-developed betting section dedicated to horse racing enthusiasts, which focuses on a wide range of thoroughbred and harness tracks. This means that Bovada customers are free to wager on the races held at the top North American tracks such as Santa Anita, Hollywood Park and Aqueduct, Saratoga, Del Mar, Belmont or Gulfstream, as well as late night racing from Australia. Aside from daily horse racing, the site allows you to put your money on horse racing futures and props, but you should keep in mind that bets of these types are usually available exclusively for high-profile events, such as Triple Crown or Breeders’ Cup. Aside from offering racing-related lines, the site gives you access to comprehensive information on each of the available tracks as well as an extensive resource of past results, which shows you the winners and payouts of each race. True racing aficionados should also check out the horse racing articles section, which brings you up to speed with the latest betting strategies and tips and allows you to access all the latest news from the racing world. The analysis section features contributors from respected industry resources, such as the Daily Racing Form, so you should definitely consider giving it a look from time to time. Bovada comes with a rather extensive live in-play betting section, which gives you access to a wide range of football, basketball, baseball, hockey and soccer markets. 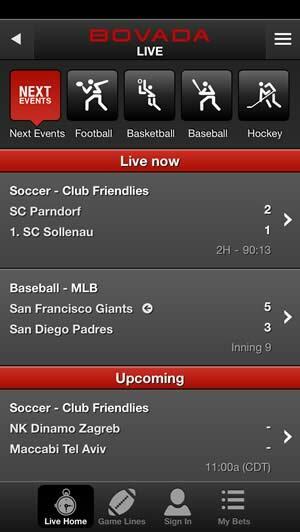 Browsing the live and upcoming events is very easy and intuitive due to an excellent, mobile-friendly user interface, which allows you to focus on planning your bets instead of trying to find the games that you’re interested in. 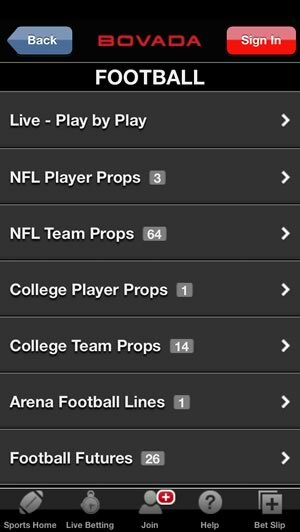 Aside from standard money lines, you’ll be able to wager on all kinds of props. For example, a typical selection of props for a major MLB game includes the total number of hits and runs scored in each inning of the game, most hits and most runs. As you’d expect, the props are frequently adjusted to reflect the situation on the field. Unfortunately, the site doesn’t offer any live streaming services, which means that you’ll have to watch the match on your TV or connect to a third-party stream in order to take full advantage of all the available betting opportunities. 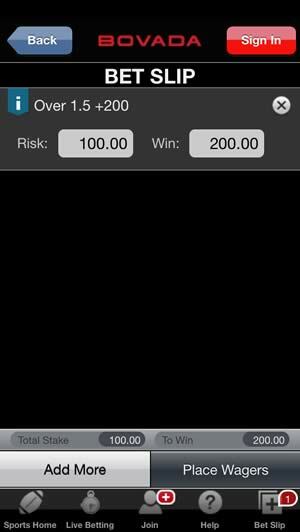 On a brighter note, just like in the case of pre-match wagers, the prices offer on live bets tend to be very reasonable, especially when compared with the other US-facing sites.